With the start of the school year here, or just around the corner for some, the kiddos are leaving the house. That being said, what better time to take a look at your bills? I have kids so I know how pricey the start of the school year can be. Keeping that in mind, and speaking from personal experience, you try to save dollars in any way you can think of. Why not take a look at your hot water ??? I get this question a lot when people run into a problem with their water heater. I always suggest they switch to tankless, and more times than not, they ask my “why” or “what’s the difference?” This post will (hopefully) answer those questions !!! For the basics, there is the obvious size difference. The tanked-water heaters (left) have been around for decades without much change. They keep a storage of hot water by constantly cycling on and off to keep temperature. Tankless-water heaters (right) on the other hand, is just that, TANK LESS. It mounts to the wall and is only on when hot water is needed. There is a sensor within the heater than activated and turns on the burner or heating element. Energy is being used all day, every day to keep the water at temperature. Larger carbon footprint… the more water you use, the bigger the impact. Limited hot water supply. Basically you get as much water as the tank can hold. So when your kid takes a 30 minute shower, you get some chilly water to scrub-a-dub with !!! Energy is not used until a demand is present. Unlimited hot water supply. So everyone can shower and no one feels like they are swimming in Antarctica. No risk of a broken or ruptured tank, which could lead to flood damage or worse. Longer life span with fewer repairs needed. Hopefully this can help you make the decision that is right for your and your family. If you do choose to make the move to a new water heater, remember to call you neighborhood plumber, Jeff da Plumber !!! 916-481-6593. I like the picture - seeing the two, side by side. Thanks for the summary! Great post. My wife and I switched to tankless about 2 years ago and the initial out of pocket cost was so worth it. We save BIG every year by not having a big, clunky machine that's cycling on and off all day long. 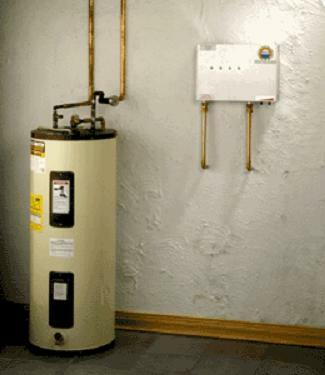 Great blog shared, the comparition between a tanked water heater and tankless water heater is very well show here. Awesome! Love your no nonsense approach to breaking down the differences between tank and tankless. Tankless isn't the best solution for everyone. Thanks for sharing! Good info. We get the same questions all the time. Tankless is the way to go. Sin,,,Am I,,, Are we sinners ?? ?